For people with the following conditions: neurological conditions including motor neurone disease (MND); cerebral palsy; whiplash; head and spinal cord injuries; MS; arthritis; ALS (Lou Gehrig’s Disease). It can also be used for those without a medical condition but who need to stop their head falling forwards on long-haul flights/coach/car trips. 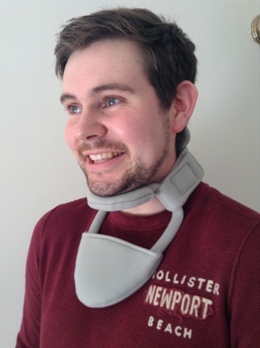 The heads first collar is a head support which provides low-profile, firm but comfortable cervical support. It is available in a variety of sizes: large, medium, small and junior. It has been developed and manufactured in the UK using Heads First patented technology following consultation with both clients and professionals. It can be adjusted for comfort, and can be used for a variety of medical conditions. The covering material is softer and more comfortable than alternatives. Unlike other collars on the market, the heads first collar is latex-free (at no extra cost), and so there is no risk of an allergic reaction. The open design gives visual access and free air movement in the neck area. Both the heads first collar and its accessories are the lowest priced product of their kind on the market. 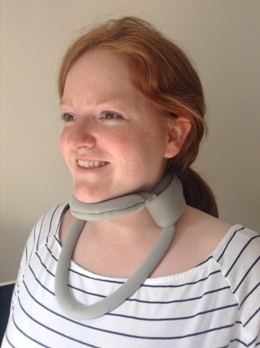 Earlier this year I purchased a Collar from you to try and limit the neck and shoulder pain I always experience for some weeks after long distance flying. I have just returned from a round the world trip including several 12 hour flights, using your Collar and I am delighted to report that I have no resulting pain. Previous attempts with other neck braces failed completely. I can therefore strongly recommend your Collar for flight comfort.